A bill has been introduced in the Rhode Island Legislature that would require labeling of any genetically-engineered ingredients in food consumed by humans. State Sen. Donna Nesselbush recently introduced two nearly identical bills to the Senate Health & Human Services Committee that would demand disclosure of any foods or ingredients that were genetically manipulated, making Rhode Island the latest state to respond to the popular movement seeking to mandate labeling. The differences in the two bills lies in how they when they would be implemented. If passed, Rhode Island’s Senate Bill 549 would simply go into effect on Jan. 1, 2017. Senate Bill 557, however, includes a trigger clause, requiring four US states outside of Rhode Island -- including one adjacent state -- with an aggregate population exceeding 20 million to pass similar legislation. 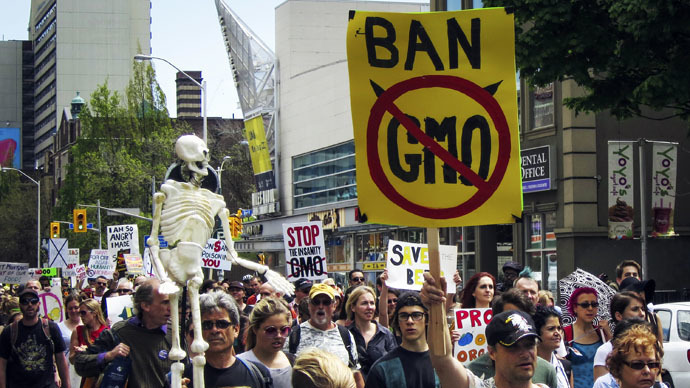 Both bills would also disallow any GMO products from being regarded as 'natural' foods. Bills requiring GMO labeling fell short in the Rhode Island legislature in both 2013 and 2014. In opposition to labeling laws, major agribusiness and biotechnology conglomerates like Monsanto have spent immense amounts of cash to cloud the ‘right-to-know’ movement in the US. According to the Center for Food Safety, dozens of states have in recent years considered labeling legislation and ballot initiatives while a handful have passed laws mandating GMO (genetically-modified organism) transparency. Voters in California and Washington State narrowly rejected ballot initiatives in 2012 and 2013, respectively, though not without dragging the likes of Monsanto, Bayer, and Dow Chemical into expensive campaigns to defeat the measures. Last November, labeling efforts were defeated in Colorado and Oregon, albeit narrowly for the latter state. In what became the most expensive campaign in Oregon’s history, Yes on 92 – the pro-labeling contingent – was outspent $21 million to $9 million by No on 92, which included major agribusiness and biotechnology companies with deep pockets, including Monsanto and DuPont, as well as anti-labeling trade group the Grocery Manufacturers Association. One labeling effort succeeded in November, in Hawaii’s Maui County, though Monsanto and Dow Chemical quickly sued the county despite voters’ wishes. Amid a wave of concern over GMO foods sweeping through the US and around the world, agricultural giants lobbying against labeling measures have spent over $100 million fighting the measures nationwide, a sum certain to increase with each passing year. In response to popular concern over the ramifications of genetically-modified organisms, powerful farming and biotechnology interest groups have joined forces, as RT has previously reported, under the name 'Coalition for Safe Affordable Food' to push a federal voluntary labeling standard for food made with GMOs. The Safe and Accurate Food Labeling Act of 2014 -- called the “Denying Americans the Right-to-Know Act” by opponents -- was introduced by Republican Rep. Mike Pompeo, an ally of Charles and David Koch, heads of the powerful multinational corporation Koch Industries. In December, according to reporting by AgriPulse Communications, Pompeo said hoped the bill would see legislative action at the committee level in March or April 2015. Congressional supporters of an involuntary federal labeling standard have countered with the Genetically Engineered Food Right-to-Know Act, reintroduced in Congress last month. Vermont’s governor signed the nation’s first GMO labeling requirement into law in 2014, to take effect in 2016, but a coalition of biotech firms and farmer groups filed a lawsuit to prevent that from happening. Connecticut passed legislation saying it would require labeling, but for the law to go into effect, it required neighboring states whose populations add up to at least 20 million residents to pass similar legislation. Maine passed a labeling bill in 2014, requiring five nearby states, including New Hampshire, to pass similar legislation before its own law takes effect. Companies like Monsanto and Dow Chemical market their own patented seeds that, given their genetic modification, can be doused with biocides to kill pests and weeds, and which can jeopardize long-term health of the soil and the necessary biodiversity of a local environment that allows for natural pollination and, thus, food security.